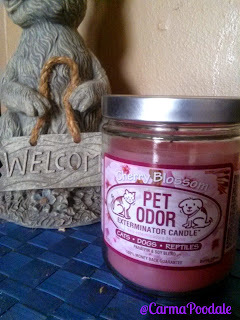 I was sent a Pet Odor Eliminator candle to review. This is my honest opinion of how this candle worked. I only talk about things that I feel would be a interest to my viewers and are Poodale Approved. If you are a pet parent, you know about smells that sometimes our sweet selves can imminent. We can sometime get a "doggie" odor, the kitty can leave a present in the box or the guinea pig can make our house smell, not so pleasant. 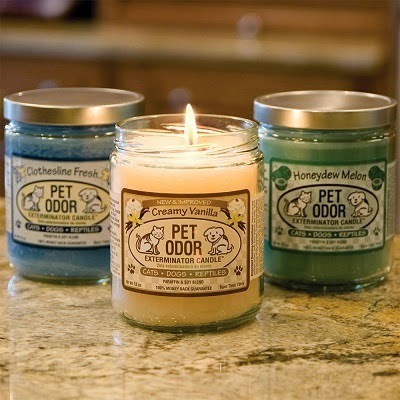 How do you keep your home smelling "Pet Free"? A couple of years ago, ma walked in the vets office and was pleasantly surprised at how nice it smelled. She asked them what they used and they told her they used a "Pet Odor Eliminating" candle. Ma bought a Vanilla scent and we loved it. It even took out what I consider a heavenly smell of liver cooking odors. Seriously humans, liver smells wonderful to us dogs! When Pet Products By Royal asked if I would like to review a candle , I immediately said YES. They picked the fragrance but sent me a candle to review. I love these candles because they make ma happy. It came just in the nick of time. Ma had attempted to bake us some fresh pig ears in the oven. She never ever EVER imagined how bad those things smell when being cooked. I have to admit that I was shocked to know that they really really did S-T-I-N-K. The smell was so bad that she took them outside and threw them away because we couldn't stand the smell.. the house smelled sooooo bad. She could have used a air freshener to mask the odor but you all know the house would have smelled like air freshener and stinky pig ear! That is when we really put the candle to the test. 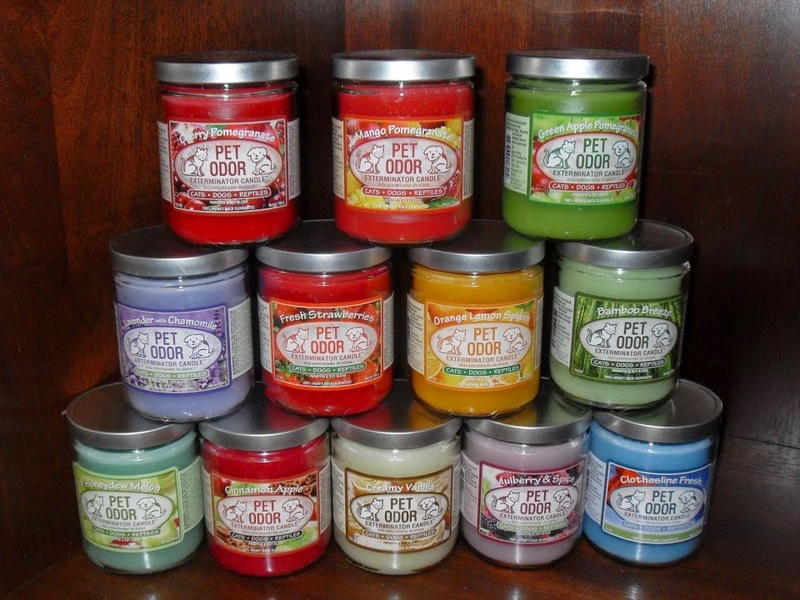 The candles don't just cover up the odor , they eliminate it. The candles have a powerful enzyme that attack and eliminate the odor. After lighting up the candle , it immediately started working. In about a hour the smell was gone. Dad and Sarah came home and said the house smelled really good. We didn't tell them what ma had tried to do earlier that day. They didn't even know she had cooked something really really STINKY. The candles have a burn time of at least 70 hours. They are cost efficient. Pet Products By Royal has a large selection of scents. The candles cost less through them than at our vets office. They have a handy "find a store near you" feature on their site. You can also order directly through them. The Creamy Vanilla is still our favorite. They have a special on their site on order 5 candles and get Free shipping. Visit their site and see more testimonials from others who have used the candles. You will want to try one of your own. See what other fragrances they offer. Don't let pet or cooking odors run your family or friends out of your house! What do you use to combat pet or cooking odors?